So, I'm already tossing around ideas for my holiday goodie plates to pass out to teachers, bus drivers, and neighbors. I want to include something savory like nuts or seasoned pretzels or a snack mix. I want to include a candy-type item like a salted almond bark or something along those lines...maybe some dried fruit thrown in ? And of course, I need to include a few different types of cookies. I thought these with the dark chocolate and dried cranberry combo would be a good choice, but when I after making them, I'm not so sure. I mean, were they good? Yes. Were they memorable? Probably not. This is a cakey-sort of cookie, which doesn't happen to be my favorite...I'm more of a chewy cookie kind of gal. But I'm thinking I could transform them by making them again and substituting baking soda for the baking powder. It's definitely worth a try since the flavor match-up is stellar. I'm not saying they're not getting eaten, though. Everybody has different tastes, and I'm guessing some people probably prefer their cookies cakey. If you have any great holiday cookie, candy, nut, or savory mix recipes that you think would make a good addition to my goodie boxes, I'd love it if you'd leave a link (and even a photo, if you like...there's a little camera/link option in the comments themselves) in the comments section! After all, a girl can never have too many choices. Cream butter and sugars together until light and fluffy. Add in eggs, one at a time, and vanilla. Beat until light and fluffy again. Add flour, baking powder*, and salt. Beat until just combined. Fold in chocolate and cranberries using a wooden spoon or rubber scraper. Scoop by scant tablespoons full onto a parchment or silpat lined sheet tray. Slide into oven and bake for 12-15 minutes, or until just golden around the edges. Remove to a wire rack to cool. *These cookies are somewhat cake-like, due to the use of baking powder (which puffs). Try substituting baking soda (which spreads) for chewier cookies. Heather, I could sink my teeth into a few of your fabulous cookies right now. They would go so nicely with my morning coffee! I love the combination of the tart cranberries with the chocolate!! I'm hosting a Christmas Cookie Exchange-Linky Party this month in honor of the holiday season. I would be honored if you would link your yummy recipe. I think with drak chocolate and cranberries, you can't go wrong. But I agree--not a big fan of cakey cookies! Oh yum, Heather! These look amazing. I haven't been around in a while so I don't know how new your "new" blog setup is, but I love it! 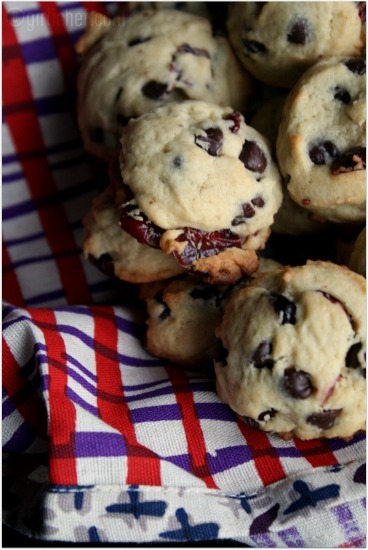 I love the combination of dark chocolate and cranberries here! I'm more of a chewy cookie rather than cakey cookie kind of girl, but these look pretty good nonetheless. 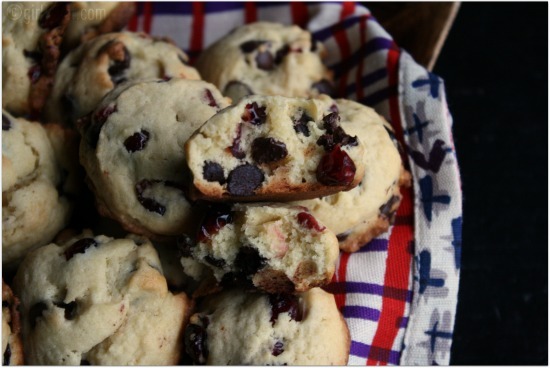 What's not to love about the combination of dark chocolate and cranberries?! Wow, they look so yummy! I cannot wait to try. I would love to receive one of your holiday goodie plates! I'm going to make my own next week. With colder days and nights, I find myself wanting to be in the kitchen more and more. Thank you for giving me another recipe to try. I hope you are enjoying the bustle of the season. Much love from Austin. i'm a chewy cookie girl too, but i also LOVE the cranberry chocolate combo. these are just beautiful! good luck with your christmas treat ideas. I have to agree with you on this one...if I wanted cake, I'd just have cake, you know? But the cranberry/dark chocolate combo does sound pretty delicious! I love the flavor and texture combination of your cookies. :) The little red peaking through is just so beautiful and festive. These look pretty tasty to me but I'm with you on chewy vs. cakey cookies. I made some brownie cookies that were pretty tasty last year http://bytes-from-texas.blogspot.com/2009/08/confessions-of-top-chef-junkie.html and some caramels that will definitely make it back this year (the truffle recipe on this post is awsome too) http://bytes-from-texas.blogspot.com/2011/01/pyrexmy-favorite-cooking-gear-slight.html - Good luck!! Heather, your cookies are great---I love cranberries with chocolate and have to try the recipe. I haven't been on the internet much lately and like your new blog layout. It's clean and crisp looking, very nice! Dark Chocolate and Cranberry, yes those cookies are calling my name, yum! Que pintaza tienen, una delicia. There are so many choices over the holidays which I am greatful for! We really enjoyed these cookies, but then again we all love chewy and cakey type cookies. I made mine big so I only got 10 cookies and they were gone in no time. I think yours look terrific! I'm not really doing much Christmas baking this year. I really need to focus on not gaining any more weight and I can't ever stay away from sweets if they're in the house. However, I do always make peanut butter blossoms with my daughter (it's a tradition I can't skip) and my Mom always makes buckeyes. So I guess our theme is peanut butter and then more peanut butter. I was thinking about making some chocolate based clusters for giving away though. Maybe chocolate pretzel clusters and/or chocolate/cherry/almond clusters? I love cake like cookies, and yours are so pretty... I d love to be your neighbore if u d come up with those every now and then. You can really sink your teeth into this! Send some over here! They look very nice! I don't really have any thoughts on alternatives though. I never knew that about baking powder vs baking soda...does that work w/ any cookie?! thanks! I am a chewy over cakey gal too. But they do look great!